Debbie Ruiz, a Warren Central High School senior, said she learned a number of things about being a news reporter by participating in a June 19-26 multimedia workshop sponsored by The Indianapolis Association of Black Journalists and Butler’s Eugene S. Pulliam School of Journalism. Ruiz was among 15 teenage participants who spent the week interning with area media professionals and working in classrooms and studios of Fairbanks Center for Communication and Technology, home of Butler’s College of Communication (CCOM). Leah Johnson, who spent the week studying print journalism, was impressed with Loni McKown’s emphasis on “how important reporting the truth is.” McKown is a professional practice faculty member in Butler’s journalism program. DMarcus Pulce, a recent Hamilton Southeastern graduate, liked McKown’s insights from her time as an investigative producer for TV and a reporter and editor in print news. “She’s been in the [news] business. That’s a real benefit to her students,” he said. Pulce combined videotaped segments of the students’ workshop projects into an edited half-hour broadcast of news and information. “DMarcus was fantastic and was very familiar with Final Cut Pro and Mac technology,” said Associate Professor of Creative Media and Entertainment Christine Taylor. She spent three days with the students as they wrote scripts for the news program and produced them in the Fairbanks television studio. 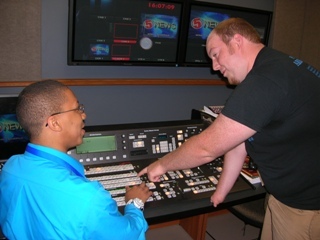 Ridle job shadowed WRTV (Channel 6) reporter Rafael Sanchez during the week. “I’ve been to Channel 6 lots of times, but I had more time this week to get more detail,” he said. Before starting her public relations internship at the office of Borshoff PR, Cathedral High School senior Ridley Morgan got a good grounding in “PR 101” from Ed Kanis. A veteran of the profession, Kanis is an instructor in CCOM’s Strategic Communication: PR & Advertising program. View samples of students’ writing and broadcast packages and workshop photos here.